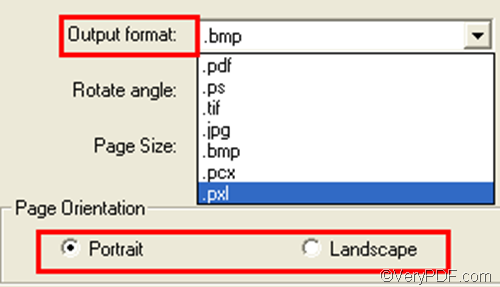 ← How to convert PCL to PCX and set page orientation? To accurately and quickly convert PCL to PXL and set page orientation, you need a professional tool such as VeryPDF PCL Converter. VeryPDF PCL Converter is a stand-alone application and also a time-saver, which is designed to create PDF, TIF, JPG, BMP, PS, PCX, PXL from PCL and PXL. The simplest way to open a GUI application is to double click the icon of that application on the desktop. You can use this way to open VeryPDF PCL Converter. When you see the interface of the program on your screen you can proceed to the next step. To add PCL files, you can simply drag the files and drop them into the list box on the main interface. Then, all the selected PCL files will be displayed on the main interface. To remove some PCL files from the list box, you can keep on pressing the Ctrl key and select the files you want to remove in the dialog box, and then release the Ctrl key and press the Delete key. Click the arrow in the Output format combo box. Click the radio box before Landscape or that before Portrait in the Page Orientation group. Click OK at the bottom of dialog box. After setting the options, you can click the fourth button under the list box on the main interface: the Start button. When the Browse for Folder dialog box appears, please choose a folder in that dialog box and click OK. Without delay, the computer will begin to convert PCL to PXL and set page orientation. Do you like VeryPDF PCL Converter? If you are using the trial version, and want to create watermark-free PXL files, please purchase VeryPDF PCL Converter by clicking Register on the interface. This entry was posted in VeryPDF Blog and tagged pcl to pxl, set page orientation. Bookmark the permalink.